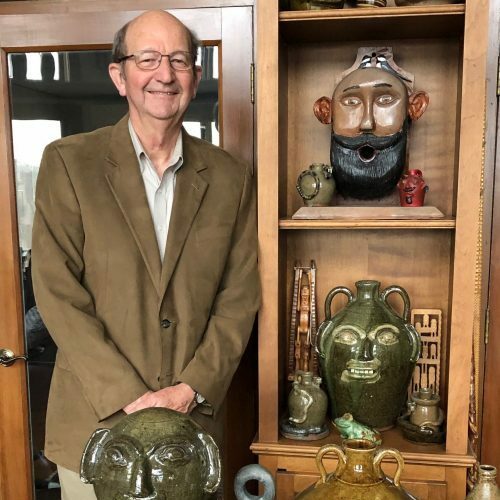 Dr. Allen Huffman and a few objects in his collection of folk art pottery. The Delhom Service League presents Dr. Allen Huffman who will speak about historic Catawba Valley alkaline-glazed stoneware. He’ll focus on work from the nineteenth century masters David Hartzog and Daniel Seagle to Burlon B. Craig and his legacy of contemporary potters, including Charlie Lisk, Kim Ellington and Steve Abee. Included in his talk will be comments on face jugs and their role in the twentieth century folk art movement. He will also discuss the education mission of the 22nd Catawba Valley Pottery Festival in 2019. Allen and his wife Barry share an interest in history, decorative arts and material culture and have been collectors of North Carolina traditional pottery since 1977. They have spent the last 25 or so years promoting North Carolina’s rich pottery history. Allen chaired the committee to establish the North Carolina Pottery Center, and Allen and Barry are founding members of the Catawba Valley Pottery Festival committee. In 2000 Allen and Barry received the Brown-Hudson Award from the North Carolina Folklore Society and in 2010 Allen received the Rebecca Hart Volunteer Award from the CCHA. Since 2012 he has been a member of the North Carolina Arts Council. The program is free and admission to the Mint Museum is free on Wednesday evenings. Come for refreshments at 5:30, the program at 6:00, and afterwards you can browse the galleries at your leisure.